If you live in Karnataka, you are no stranger to Chutney Pudi. Pudi means powder, so this is roughly, chutney in powder form for you. 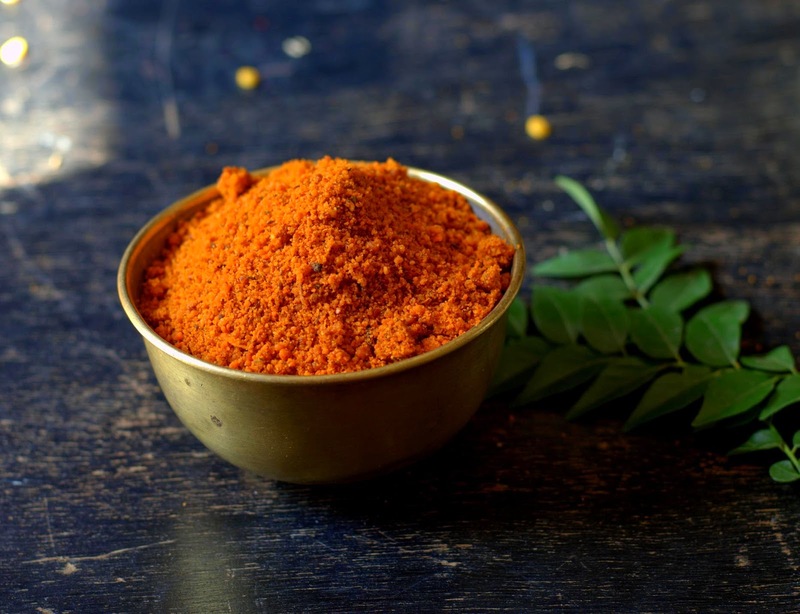 You will always find a big box of this on the kitchen shelves of every self-respecting Kannadiga, albeit different versions and different recipes. Most plates of steaming fluffy idlis and crispy dosas have a tiny heap of this powder along side the chutney (the wet kind) and sambhar. Some of us from the North of Karnataka will be miffed at the idea of eating avalakki vaggarane, mandakki vaggarane, and uppittu (upma) without chutney pudi. No actually, we eat chutney pudi with uppittu and avalakki. To the extent, my mother gets annoyed every time there is a holler for some more chutney pudi. ''We need a person to manufacture only this pudi exclusively for this household!!'' you can often hear her grumble. Not that anyone ever sacrifices a second and third serving to placate her! 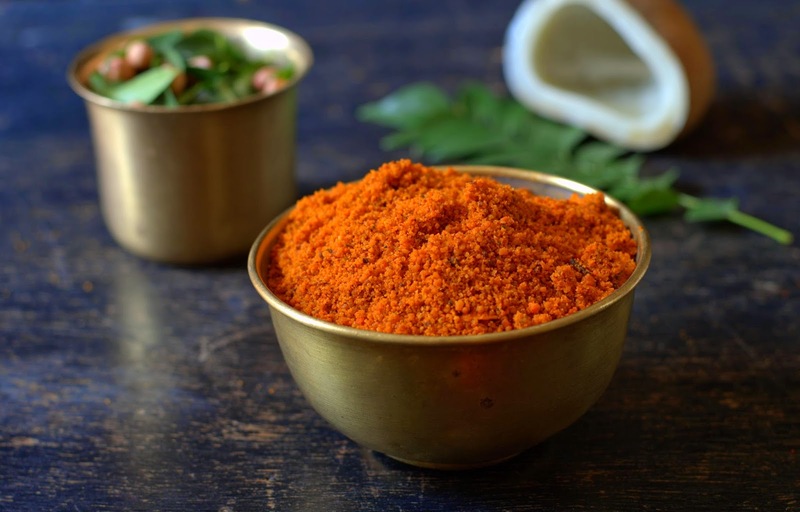 All wedding preparations start with the making of kilos of chutney pudi and menthyada hittu, another versatile, very flavorful but bland powder made with mixed lentils. Mention wedding preparations at home and you can bet your next dose of filter coffee, at least one person around will ask " Is the chutney pudi and menthyada hittu ready? These are packed in covers, small ones for guests, big ones for close family ; ) along with chakli, mandakki unde and other snacks to be given along with the tambula and the mandatory 'return gift'. Of course, there is invariably feedback, comments and ratings on these from folks who receive them! And then there is the small army of people you need to feed in a wedding household. Having chutney pudi and menthyada hittu around is a life saver as it fills up any empty spaces on the plantain leaf. Often after the first 'batch' of dinner is served, you can hear the kitchen in-charge for the evening (one of the elderly Aunts mostly) whispering about an unexpected shortage of rasam/sambar/ kootu . No panic! We will serve some chutney pudi! Hungry kids bawling for a snack or (more) visitors in the bedlam? There will be a huge box of chutney pudi avalakki (a dry snack made with rice flakes) and the usual snacks all ready. I am too lazy to grind chutney for the dosa / idli today? No worries, we will eat it with the pudi doused in oil or melted ghee. Oh did I mention, its also heavenly mixed with hot rice and a dollop of ghee! I know by now, it is all coming out of your ears. But this is one tongue tickling spicy pudi we all love to have around. Handy, spicy, versatile, lip-smacking. Time consuming yes, but keeps well. If your mother or mother-in-law or 'expert' Aunt doesn't pack pouches of this for you, and you don't already have that family heirloom recipe, here is how my mother makes it. 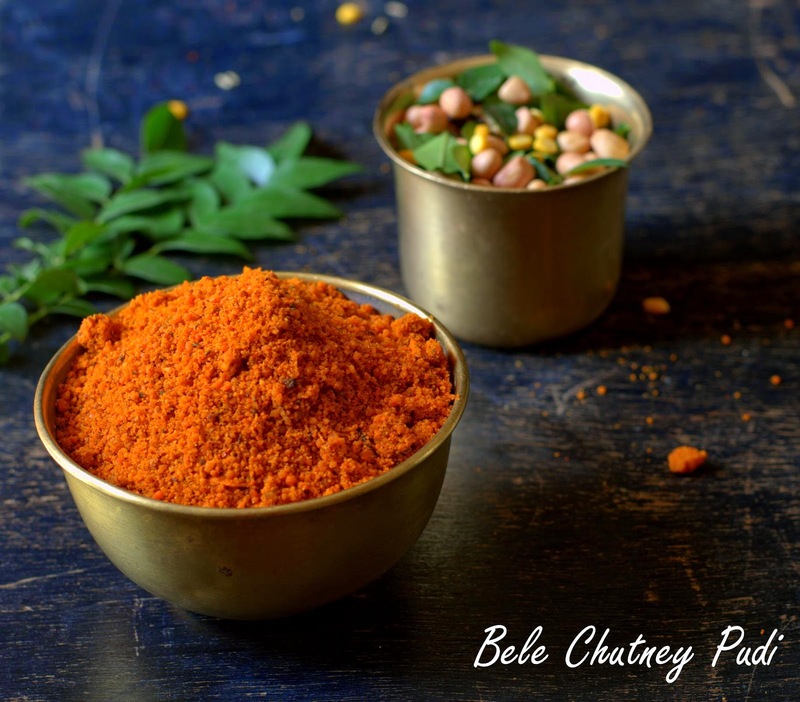 This version is called Bele Chutney Pudi as it is made with a larger proportion of lentils, making it a healthier, protein rich one. This is a rough guide (OK Amma eye balled and I measured it, hence the odd measures), do go by your taste, please refer the note below. Method : Measure and set aside all ingredients separately. In a heavy pan, dry roast each ingredient on low heat separately till light golden and aromatic. Cool on separate plates. Grind the chana dal, urad dal, coriander, jeera and peanuts one by one till slightly coarse. Dump in a large vessel. Toast the coconut till light golden, curry leaves till crisp. Warm the tamarind till it is slightly crisp. Take a small portion (about a cup) of the ground lentils, add the tamarind, curry leaves and process till fine. Then add the coconut and process very briefly till it is done, do not over do or it will turn oily. Roughly mix together all of the above ground ingredients, add the jaggery and grind again very briefly just to combine. Heat the oil, switch off once hot, reserve 2 tablespoons of it. When it is just barely warm, add the chilli powder and hing. Mix thoroughly with the rest of the ingredients with your hands adding salt to taste. The powder should not be very dry. Add the reserved oil if needed. Store airtight. Please note : Too much urad dal will make the pudi smell odd, the proportion of chana dal needs to be almost double this. You can use more of peanuts and coconut, but then you may need less oil later. Be sure the hing is strong and of good quality. 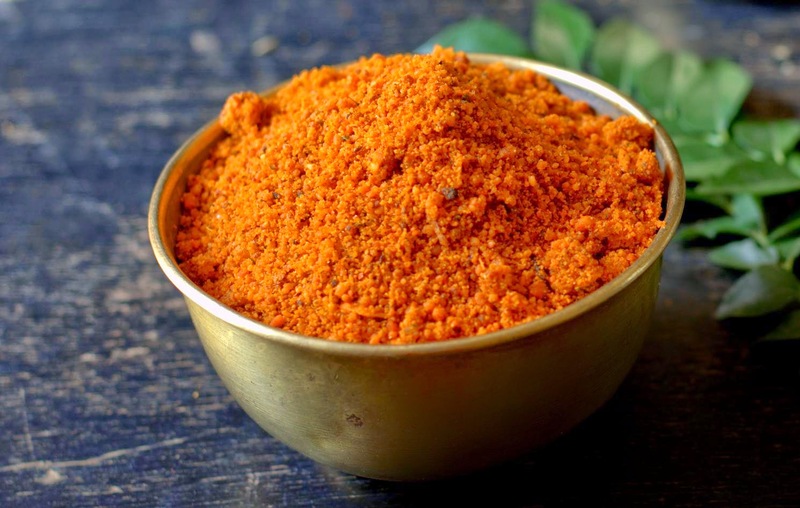 Do not shy away from using enough chilli powder and the spices, or your pudi may taste bland.